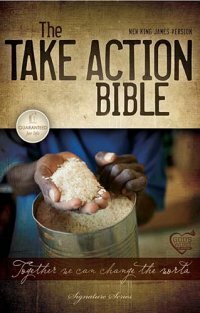 Want to be more active in your faith and be inspired by others stories of action, then this is the perfect Bible for you. This New King James Version Bible reads like similar Bibles, yet has stories of people from around the world who are making a difference in the Body of Christ. People who are answering the call to Go. Serve. Give. Heal. Teach. The stories are inspirational in that some are missionaries giving up all they have to serve in a foreign country, to those having a lemonade stand and raising money to donate. The stories show that we all can participate and be more active. If you need suggestions the Bible has 52 action ideas at the end, along with the scripture it pertains to. There are fantastic color maps, a small concordance, and a Bible study plan at the end of the Bible as well. I read through the book of John and found it right on and accurate with other Bibles I have read. Jesus words are in red which helps me to quickly find quotes I may be looking for that I know Jesus spoke. Beautiful cover, light weight paperback Bible that is not bulky at all. I plan on using it as my primary Bible for reading through the Bible in a year. I received this book from BookSneeze.com in exchange for a review.